Japanese indies face an uphill battle. One man and his world of onions is helping lead the charge. It’s very difficult to hear anything on the floor at the Tokyo Game Show, even on the relatively quieter business days, and language barriers only make it worse. I handed Yoshiro Kimura one of my business cards and we shouted at each other a bit. Vee? Vee Gee? Vee Gee Twenty Four Seven? “I think I know,” he said, doubtfully. “I wrote a little article about your Twitter feed,” I said, planning to lead into my first question, but Kimura interrupted. We beamed at each other. We both think an onion tweeting is hysterically funny and a good use of our professional time. This is a powerful connection. This chat with Kimura was my one selfish little window of indulgence in an otherwise responsibly packed event schedule, and I really, really needed it. I’ve been meaning to write this interview up for some time, but something always comes up. I wanted to talk to Kimura because I like his games (he was project lead on Little King’s Story, but also worked on cult favourites Chulip and L.O.L: Lack of Love, among others); I like his sense of humour; and I like the fact that he talks openly and honestly about the growing but painfully under-appreciated indie scene in Japan. There are many channels in the US and UK whereby independent developers can network; help each other; bring their work to the attention of the public, the press and publishers; and generally establish themselves. It’s not easy, by any means, but this many years into the indie revolution (or whatever), there’s visibility, celebration and support networks for those who choose to take advantage of them. Until quite recently, it’s been much tougher in Japan. 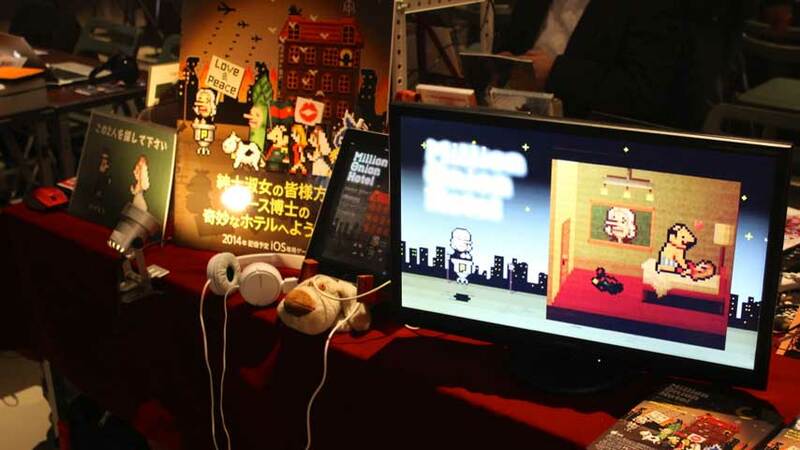 The premiere indie development festival, BitSummit, is only three years old, and the big mainstream events still don’t give indies the kind of celebratory prominence they enjoy at western shows like E3 and GDC. “I dream about it sometimes,” Kimura said, when I asked him if he’d like to see his own games at the IGF or featured on stage at E3. “When I went in to GDC 2012 in San Francisco, it moved me very much. What a wonderful scene! I want to be here again, as an indie game designer. But I also felt that my ability would never be as high level as other indie game designers. This comment wasn’t just modesty; it rapidly became apparent to me that Kimura is extremely humble – maybe too humble for the independent life, which requires a great deal of self-promotion and can be absolutely bollocksed by self-doubt. “But you’ll take your games back, and people will be just as impressed by you,” I suggested. “Yes,” he said. “I could make my own art again. “The people I met at GDC who make games – they were very peaceful. I love it. It’s artistic. And each one, they’re expressing art – not fighting. Not war. Just showing their expression. “What is interesting? What is funny? Entertaining people is so important. That is a very important part of the US [indie scene]. That’s why I want to go back and show my game to those people. Even if I cannot show my game at the IGF, even if I cannot go to GDC, I need to show my game in the US, to other indie people. It seems that making games is a form of artistic self-expression for Kimura; “I don’t want to make other people’s games,” he said to me at one point. But the realities of the indie life – financial and business struggles, working alone – took their toll on him. “Before I went to GDC, I was like a lost child,” he said. “I lost hope in the Japanese games industry. “My situation was: how can I make my own games? How can I make them without using a lot of money? And I was like – how do you call this?” Kimura mimed something I recognised all too easily. “Depressed, yes, yes. Watching Kimura’s face light up with the memory, having seen just a hint of the darkness he’d faced before this life-changing trip, was a joy. “And do you see that beauty in Japan, now that you’ve had that experience?” I asked. “I knew you would ask that,” he said. “Before, I was very disappointed in the Japanese industry. But now there’s a lot of hope in Japan. “I started to make my own company after GDC 2012. But it was so difficult to make my own games suddenly. I must gather people, and I need money for my life, I must live; I must eat rice! It was very hot and very noisy and we were surrounded by a small but fiercely beautiful cluster of indie booths. “That’s – that’s a good ending to the story,” I said. “Yes,” Kimura said. He smacked a fist against his thigh and turned his face away from me. It was definitely A Moment. “And now here we are, surrounded by so many beautiful things,” I said. “Yes,” Kimura said. “And this must only be a fraction of what’s out there,” I said. “Yes, yes!” Kimura said. Doujinshi are self-published works – the essence of indie. The term is mostly understood by westerners in reference to amateur manga, often fan fiction of professional works. It can be applied to many creative works, though, and doujinshi games are flourishing. Some are eventually picked up for professional release, as with Corpse Party. Perhaps the closest western analogue may be the modding scene. “Nobody knew,” he added. “That there were a lot of Japanese indie games. But we didn’t know each other. You didn’t see them like this. But after BitSummit, we gathered the people together, along with the doujin community, and we are like family now. Each of us knows what the other people are making. We help each other. Kimura has expanded his team slowly; Onion Games was five strong at the time of this interview. He said he only wanted to work with his friends, and that each of his colleagues has a particular, very special talent. And each of them wants to work on Kimura’s games. “If they feel they want to make their own games, they can say goodbye to me,” Kimura said, laughing. “I was thinking about this. If each of them says ‘goodbye, I want to make my own game’ – I must say ‘yeah, good! Cheers! Bye Bye! Thank you! See you again.’ I will say so. I love it, too, although I honestly have no idea what’s going on it, even after trying Million Onion Hotel. I told Kimura that I didn’t understand his game at all, but that only made me like it even more. This is part of Kimura’s plan – to bring his art, or his “world” as he calls it, to as many people as possible. As it happened, the day we spoke was the one year anniversary of the English-language Twitter feed that had put me on the path to meeting him. He made me switch my dictaphone back on so he could tell me about it. “‘I am a tiny onion. I want to spread Japanese video game information to the world.’ The first moment was like this,” Kimura said. I took the opportunity to ask a burning question: the tweeting onion seems to get eaten pretty regularly. Does it get reincarnated, or what? “Every onion was eaten by me. In onion salad, onion soup. All onions have the same will, the same memory. This is my world: onions,” Kimura explained. “And they love it. They love it when humans peel the onions.” Oh yes, I remembered that: being peeled is incredible ecstasy for onions. I guess Kimura is kind of an odd guy. But I like odd. Odd, and weird, are words I use positively. I despair of those comments you see everywhere – “dafaq did I just watch”, “weird :s I don’t get it”. I despair of the lack of playfulness, imagination and pleasure in discovery that hinders the creative growth of this, the most potent communication medium the world has ever produced. There’s an unfortunate tendency to fetishize Japan as a wonderland of kookiness, a geek’s paradise. The truth is it’s just a place, good in some ways and bad in others, and its mainstream games industry shares traits with the worst western practices, with companies acting like content mills rather than creative hotspots (GI.biz has a great piece on this today, as it happens, building on the conditions at Konami that reportedly pushed Hideo Kojima to the breaking point). Ground down by this climate, Kimura went to GDC, where he met like-minded people and had his eyes opened to a world of possibilities – of creative control and artistic freedom, but also a world in where he can bring his vision to life, celebrate the strengths of gaming as a medium, and connect with an audience. Meeting Kimura in the sound of fury of TGS reminded me of that world, too. 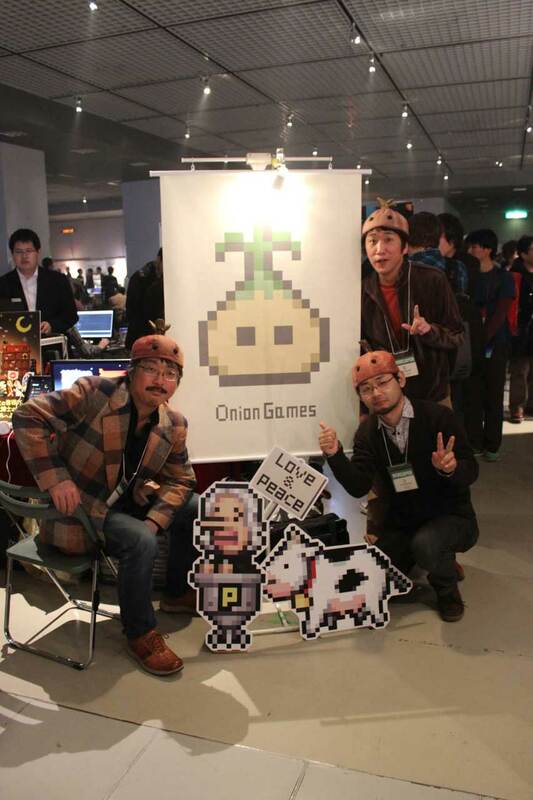 Onion Games is currently working on an iOS title called Million Onion Hotel. It has not yet been dated. Brenna is going back to TGS again this year and hopes to avoid crying in the bathtub. Update: I have been alerted to Kimura’s side project, Brave Yamada Kun – an iOS RPG about a guy who makes RPGs. It hasn’t been dated either, because the universe hates me.